It’s been a while since I’ve taken you along on a Project Journey, hasn’t it? Well, since the Medallion, anyway! I’m setting off now on two stitching journeys simultaneously, each one vastly different from the other. One project, you see, is being prepared as a possible teaching project. This means it can’t be published in full. The other is for collaboration on a book. And this means it can’t be published in full. And now you are privy to my sad blogging dilemma! But we’ll work through the dilemma, and hopefully we’ll find an acceptable middle way. Throughout both journeys, I’ll be sneaking you updates and even little embroidery tips that stem from the projects. The first thing I did after working out the two designs was work up a color palette and think about threads. The first project, which we’ll call Round for now, involves a range of colors. My threads? Not quite sure! If I reduce the project in size, I can work with a couple different types of silk. If I keep the design the size it is right now, wool is the only way to go. So I’m debating about the types of threads. I’ll be digging into the thread drawers soon to see what I can come up with. Even if I go with wool for the majority of the project, I may mix some silk in there, too. The ground fabric? Round will definitely be worked on linen – white linen, no less. The look of the thing I’m trying to mimic requires a white background, definitely, and you already know I’m obsessed with linen, so that choice was easy enough. And this is the type of project that will involve as many different stitches as possible (without detracting from the overall coherence of the project, of course!). Color + Stitch Variety = Excited. So, more on this little fellow later on! I can’t wait to start stitching on him! The second color palette, for a project I’ll call (for now) The Needle is Mightier than the Pen (or Pen, for short), isn’t so difficult to come up with. 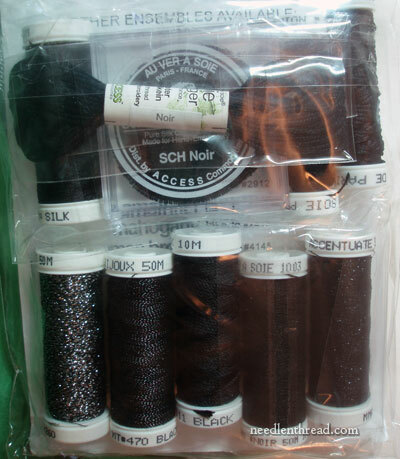 It will either be this black silk collection from Au Ver a Soie, or it will be a collection of various whitework threads. I haven’t decided yet if I will work the project in black on white, or white on white. Or two projects, one each way? Or a combination of black and white in one project? This, I’m still debating about, but I’ve got the fabric set up and the design ready to transfer, so I’ll be making the decision pretty soon! For the ground fabric, I’m using…. (now, this’ll be a surprise)… linen. Those are my next Big Projects. They’ll easily take me through the end of the summer and well into the autumn months. And probably beyond. I’ll keep you updated on progress along the way! And now, I better go clean up my workspace so I can get some stuff done…! Enjoy your day! Very well done–not giving away much about the two projects. However, now you made us very curious indeed! I understand your love of linen. What thread count do you plan to use for these projects? Do you normally use the same thread count? The Pen project: hmm, if it’s something that looks like sketch work, then black on white would be good. One of the British magazines had some patterns like that recently and they were pretty cool looking. But it was all stitched. But I don’t know what your idea is. . . . yet. Sneak hints as often as you can. 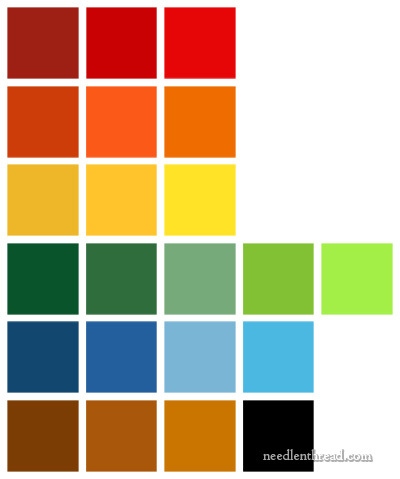 How do you work your color palettes? Do you use a software? Those colored squares look very interesting. Dear Mary– I like the 25 count round linen, but not the cream and white is too harsh for the planned project. Have you ever tried dying linen, perhaps with tea for a soft look. I have breakfast with your site every morning, starts the day right. How come I think about the rooster when I read the first project??? The second — I think of the fish …. 🙂 you’re right! Sort of! The first one is a rooster, but quite different from the previous rooster. However, the second one is not a fish, and it involves different techniques! Hi Mary! May I vote for white on black? Wow, that was my first thought too. As my old grandmother used to say ‘great minds think alike, but fools fear to differ’. I think we fit the first category don’t you? Mary, my second thought was those gorgeous black threads on dark charcoal-coloured fabric. You can tell I love monochrome and tone-on-tone, can’t you? Of course you won’t do it that way, but do you think it would work? I think black on a charcoal fabric would be difficult, not just to stitch, but also to show off the stitching. I could see black on a lighter charcoal fabric, or a medium grey, like the Puritan Grey by Legacy (I like that linen!). But I think dark on dark is difficult all around. It might work with some mid-tones mixed in to give it the look of a relief design, but for me, I don’t tend towards too much dark in my stitching. Could be an interesting challenge, though! I hear you Mary! Years later, I’m still mumbling over a black crewel project on black wool. it was barely survivable even with strong light! Christina’s idea did get me thinking though. That “military school uniform” look of black passementerie on dark grey wool comes to mind. It’s a very subtle & elegant idea but maybe not appropriate for the design you have selected. Regarding white on black–the current issue (#77) of Stitch (Embroiderers’ Guild–UK) features a very effective example on linen. I know for sure i would love ROUND a lot. The colors is so beautiful!!! It would be really cool if you choose the AVAS Black selection – I’d love to see that variety of threads used together in a piece, and how they work together. A ‘white work’ piece would work really well for that purpose.